Have a blast OF FUN | A.B.E. Remodeling, INC.
Hello Everyone. Time sure flies. Can you believe it's time to get out the red, white and blue. Wear your colors in pride. Put up Old Glory. 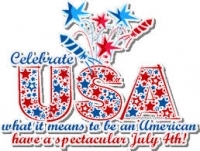 Celebrate July 4th. Enjoy our freedom- Remember those who gave it all so you could have some. Keep the USA proud- though some things seem discouraging- this is our country.. Born & Raised pride. We want to wish everyone a Happy 4th of July. We're halfway to Christmastime...... it's time to think about that remodel project you may have been putting off. Give us a call. Enjoy summer and have a great holiday weekend. Though we want to complain about the heat....remember the cold and drab of winter and take what we get.